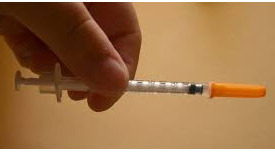 What are Sharps and Why are they Dangerous? Sharps are items which have sharp points or cutting edges capable of causing injury to, or piercing of human skin when handled. Needles, blades and broken plastic or glass are examples of sharps. Sharps can cause injury through cuts or puncture wounds. Furthermore, sharps may be contaminated with blood, bodily fluids and/or hazardous substances which could cause infections and/or illness if they enter the body. The correct PPE must be worn when handling sharps, for example- gloves. Sharps must not be directly passed between users. They should be placed down by the first user and then picked up by the second user. If you are injured by a sharp, you must immediately wash the area with soap and water and notify someone and receive first aid attention. 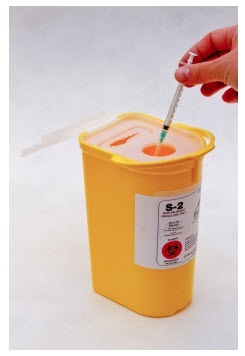 They need to be disposed of immediately after usage into a sharps disposal container; UNDER NO CIRCUMSTANCES SHOULD SHARPS BE PUT INTO GENERAL WASTE CONTAINERS. Whoever uses the sharp should dispose of it; this reduces the risk of contamination. Needles should not be re-capped as there is a risk of piecing skin when attempting this. If you know for certain that the sharp is not contaminated then you may dispose of it yourself. 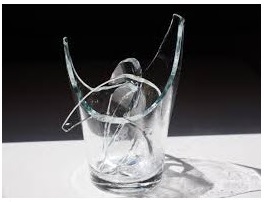 For example, you have just dropped a glass object. You may dispose of it by using an object to safely collect it, for example a dustpan and brush, double wrapping it in paper; and then placing it in the sharps disposal container. UNDER NO CIRCUMSTANCES SHOULD SHARPS BE PUT INTO GENERAL WASTE CONTAINERS.